The LWRC IC-ENHANCED Patriot Brown Carbine was developed in response to the requirements of the U.S. Army’s Individual Carbine program. 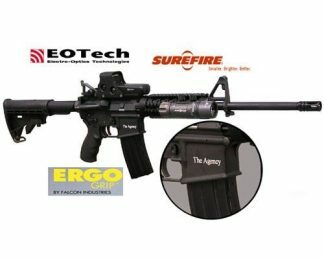 It features some radical new features while maintaining the same basic M4,AR15,M16 architecture. The LWRC IC-ENHANCED Patriot Brown Carbine features a fully ambidextrous lower receiver. Dual controls for bolt catch release, magazine release, and fire control mean that right and left handed shooters can use the rifle to its full effectiveness. It also means that when the shooter transitions to their offhand side due to barriers or injury, they can effectively manipulate the controls without having to switch hands. The LWRC IC-ENHANCED Patriot Brown lower receiver is compatible with all legacy AR15 upper receivers. The LWRC IC-ENHANCED Patriot Brown Carbine is a further evolution of the M6A2-SPR platform introduced in 2011. TheLWRC IC-ENHANCED Patriot Brown Carbine features a 2-position gas block, user configurable rail system, and a revolutinary new upper receiver that has the mounting base for the handguard machined as part of the upper receiver for added strength and reduced weight. The 2-position gas block has settings for Normal and Suppressed fire. The LWRC IC-ENHANCED Patriot Brown Carbine Spiral Fluted Barrel is compatible with the U.S. M320 40mm Grenade Launcher, the M26 breeching shotgun, and the M7, M9 or OK3S Bayonets.